What is the longest headed bolt that Portland Bolt can manufacture? 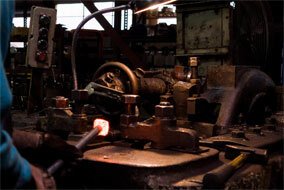 Portland Bolt uses National Upsetters to hot-forge the heads onto bolts. The end of the round bar is heated using an induction process and placed horizontally into the upsetter where a plunger compresses the heated steel into the shape of the bolt head. Because this process is a horizontal forging process, Portland Bolt is only limited to manufacturing a bolt length based on the length of the raw steel. Most bolt grades can be made from steel that is available in 20’, 24’ or 40’ lengths. This means that Portland Bolt could manufacture a headed bolt that was 40’ long if needed. If a project required a bolt length that was longer than the standard steel produced, Portland Bolt always has the ability to get specially rolled steel in longer lengths. The ability to hot-forge bolts on National Upsetters gives Portland Bolt a significant advantage over the cold-heading process or a vertical press. Both of these manufacturing processes are very limited in the lengths that can be produced. A press heading system forges the bolts vertically where the press forms the bolt head by using downwards force. The distance between the press and the floor would be the length limitation, typically around a couple feet long. A cold-heading system in which fasteners are mass-produced has very tight length limitations. Some cold-heading facilities have length limitations as short as 6” but others can go up to a couple feet. Cold heading equipment is very difficult and time-consuming to set-up so the manufacturing run has to be a significant quantity in order to make the bolts. With Portland Bolt’s hot-forging process, we can make a handful of custom bolts in virtually unlimited lengths with minimal set-up time. If you have a question about the heading process at Portland Bolt or need a quote on some custom headed fasteners, give Portland Bolt a call! Our knowledgeable estimators are standing by to assist you with your fastener needs. Are die seams allowed on headed bolts? Does the length measurement of a bolt include the head?